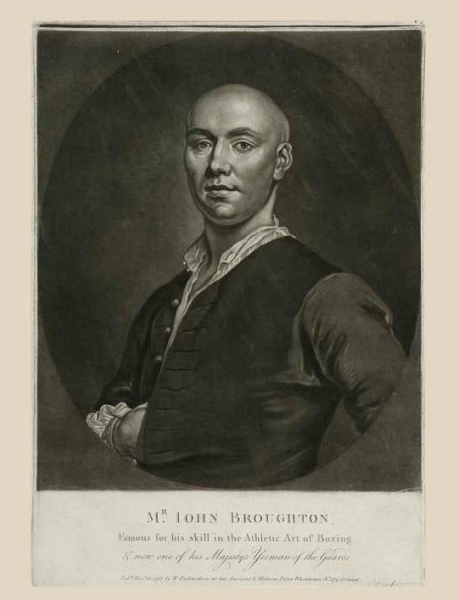 John Broughton (1704-1785) was known as the Father of Boxing. He became champion by defeating George Taylor who, with the backing of Frederick, Prince of Wales, had claimed the championship on the death of James Figg in 1734. In 1741, the Prince backed the Yorkshire coachmen, George Stevenson, against Broughton who beat him so badly that he died of his injuries. the Duke of Cumberland, who had heavily backed Broughton, now became his patron and persuaded him not to retire from the ring and financed the opening of his own amphitheatre and later an Academy in Haymarket. Broughton had, meanwhile, published his Rules in an attempt to restrict further injuries and it was at his Academy that he introduced boxing gloves, known as mufflers. Broughton was eventually beaten by Jack Slack in 1750, which cost the Duke over £10,000 in wagers. A bad loser, the Duke closed Broughton's premises and prize-fighting was made illegal. Broughton became a successful antique dealer and later a Yeoman of the Guard. He died at the age of eighty-five, leaving a fortune of seven thousand pounds. Richard Humphreys, the Gentleman Boxer, was said to be the son of an army officer. A stylish southpaw and pet of the Fancy, he was a popular tutor at his rooms in Panton Street. He seemed set to succeed Tom Johnson as champion but was foiled by the appearance of Daniel Mendoza. 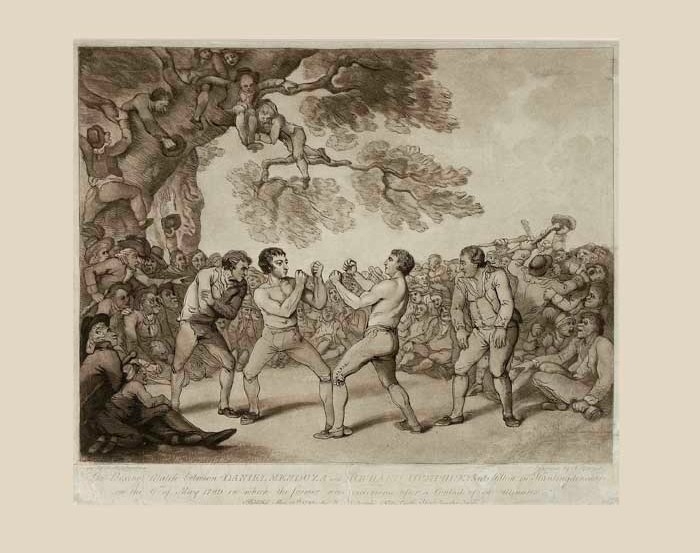 Their rivalry fostered a golden age of English boxing and their fights generated more public interest than any other sporting event in the eighteenth century. Each enhanced the spectacle and appeal of the prize-ring by his contrasted style and skill: Humphreys, the clean-cut athlete with his upright stance and Mendoza, the perfect foil, flamboyant in appearance and boxing style. 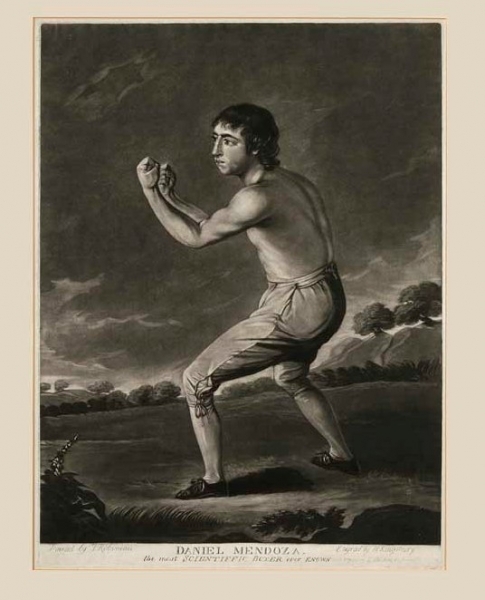 Daniel Mendoza (1764-1836, champion 1794-95) was the most elegant and scientific boxer seen on the prize-ring. Born in Aldgate, he started fighting at 16 but his first contest of note was his victory against Harry the Coalheaver at Mile End in 1784. In the first of 118 rounds, Mendoza sustained severe punishment and for the next three years devoted himself to a complete study of the art of defence. 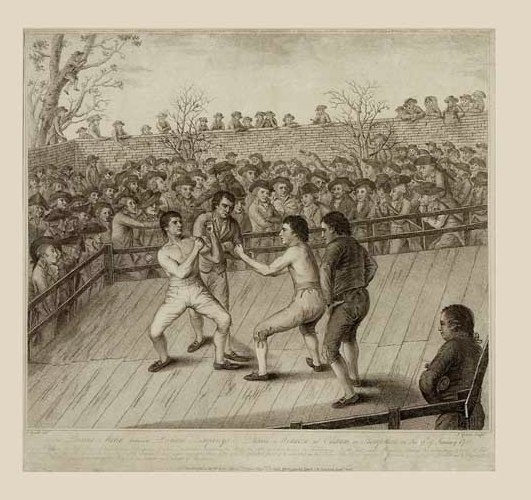 When he resumed boxing, the Prince of Wales was so impressed that he was said to have arranged the match with Martin the Bath Butcher whom he defeated easily in just twenty minutes at Barnet racecourse in 1787. Humphreys had defeated Martin a year earlier. With the prize-ring now patronised by the Prince of Wales, the law was inclined to turn a blind eye to the illegal sport and with a great number of the nobility attending the schools run by Mendoza, Humphreys and Jackson the age of the gentleman boxer had arrived. The contestants are shown at the start of the first of their three fights, which Humphreys won in 29 minutes. Also in the ring are Humphreys's second, Tom Johnson, Mendoza's second, David Benjamin, and a bottle holder, Jacob Healer. The Jewish community in the East End had heavily backed Mendoza who arrived with two pigeons. A white pigeon to carry the result if he won and a black one for if he lost. Although Humphreys started from favourite, for the first fifteen minutes Mendoza had the best of it, flooring his opponent six times. Early on with Humphreys off balance, Mendoza aimed a terrific blow which might have ended the fight had Johnson not intercepted it. THe umpires overruled this blatant foul and allowed the fight to continue. Rain had made the ring slippery and both fighters had difficulty keeping their feet. Between rounds Humphreys removed his shoes and donned a pair of worsted stockings which gave him better grip. The advantage proved decisive. Mendoza fell awkwardly, spraining his ankle and was unable to continue. The black pigeon was released. Mendoza's supporters in the East End were said to have lost over £50,000. After defeating Mendoza in the first match, Humphreys was encouraged to challenge for a return at £250 a side. This was refused as Mendoza had not recovered from his ankle injury and it was not until November 1788 that the terms were finally drawn up. The fight took place in a walled paddock owned by Sir Henry Thornton. To accomodate the huge crowd attracted by the intense rivalry of the two contestants, an octagonal amphitheatre for three thousand with tens rows of seats was erected around a 48 ft. ring. The entrance fee was half a guinea. Although Mendoza had now fully recovered, Humphreys, who had suffered from sciatica during the winter, was a shadow of his former self but still started as the favourite. For the first 40 minutes the fight was fairly uneventful with Mendoza scoring most of the knockdowns. However, in the twenty-second round, Humphreys dropped before Mendoza's blow struck him. The articles specified that he who fell without a blow should be declared the loser and Mendoza claimed the victory. Humphreys's backers disputed this and the fight was resumed. mendoza was now obviously on top and over several more rounds Humphreys fell without being struck and Mendoza was declared the winner. 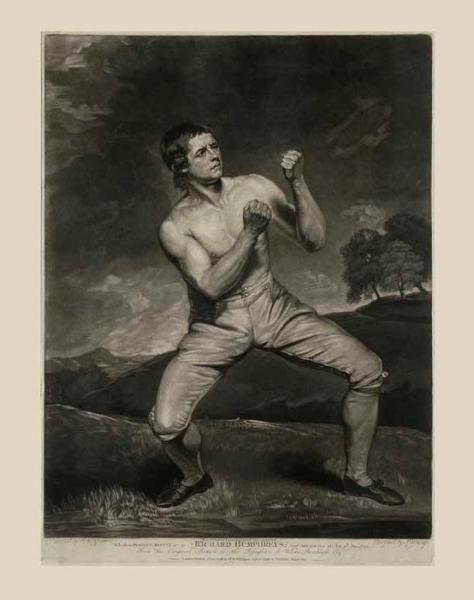 The British Sporting Art Trust has a large collection of boxing prints. Click to search the collection.